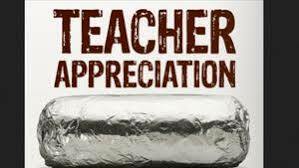 Today is Teacher Appreciation Day, and Chipotle had a buy one, get one free special offer for all teachers. I hadn’t gone grocery shopping and it was a particularly hot day. The last thing I wanted to do was cook, so I decided to take them up on their offer. I’d put my pay stub in my pocket to prove I was an employee at Prospect Sierra, so at 6 pm, shortly after the last child was picked up from After School (where I’m the director), I headed to the El Cerrito Chipotle, which is on my way home from work. The parking lot was a madhouse. People were stuck, trying to get out, and cars were coming in through the exit, making it even more congested and confused. I drove a block and a half away, found a spot on the street, and walked there. The line was as long as I’d ever seen it, but I was content to play Two Dots on my phone while I waited. Twenty minutes later, I finally arrived at the counter and pulled out my pay stub to show the server. He didn’t even look at the paper I was holding in front of him; he just called over another guy who told me I needed to show a school ID. I explained that my school didn’t issue ID cards. He looked skeptical, as if that just wasn’t within the realm of possibility, so I must be trying to scam him. I told him I taught at a private school where we didn’t need IDs. He shook his head and said the only way it would work was if I could show him an ID. He didn’t even say he was sorry. I was angry, but I walked away without causing a scene. I got in my car, vowing to never go to Chipotle’s again. But I was really hungry too. Then I got an idea. I called the Chipotle in West Berkeley–the one I’d visited often when I worked off Gilman. I told the man who answered that I was a teacher and had a pay stub to prove it, but the El Cerrito Chipotle wouldn’t honor the special offer for me. Then I asked if I came to the Berkeley Chipotle, would my pay stub be enough to prove I was a teacher. He said he thought he could make an exception and asked my name. “When you get here, tell the person at the counter your name, and I will make sure you get your free burrito,” he assured me. So I drove to the Berkeley Chipotle and waited in line again, but only for about ten minutes this time. True to his word, the Chipotle employee made sure I got the teacher deal. I thanked him and changed my vow to never frequent the El Cerrito Chipotle, but the Berkeley Chipotle would continue to get my business. I took home dinner for my husband and me and didn’t have to cook. Thank you, Berkeley Chipotle! Should so much depend on a bath mat?